Are you feeling juicy? Are you wanting some slot games online? 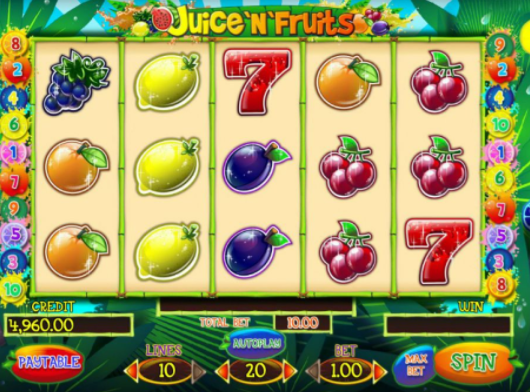 Juice n Fruits is a 5 reel online slot game filled with a game board filled with wonderfully animated symbols ranging from watermelons and grapes to sevens and bars. The game board hovers over a jungle paradise. Spin today to get the juices flowing and earn yourself some significant cash rewards. The UK slot games team at Playson comprises some of the most talented and dedicated people in the online casino industry, always striving to improve their games and come up with better, more entertaining and financially rewarding experiences. Their slot games have unique and exciting themes, and most players will find themselves returning for more. Juice n’Fruits is a relaxing, refreshing experience with a retro feel and a simplistic gameplay. 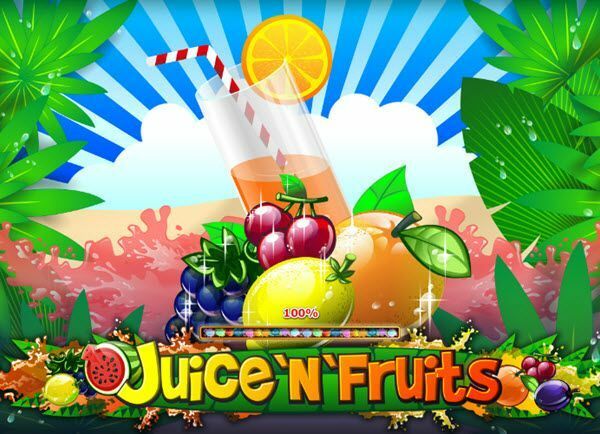 Juice n’Fruits is reminiscent of the classic slots machines, exploring the vintage fruity theme, while still using graphics in a modern way, to offer a visually pleasing experience. Sometimes you get tired of all the complex reels and extra Bonuses, and you just want the simple pleasure of playing and winning, without the pressure to unlock different features. This slot game is perfect for taking a break from all the details and concentrating on the essence of the online casino fun. Juice n’ Fruits has 5 reels and 10 paylines of easy-going entertainment. Unlike the regular fruity themed games, this one has a more vibrant background, packed with vast vegetation and cocktails, giving everything a refreshing, tropical touch. It feels like a summer day, when you sit outside and drink a lemonade, but you also find prizes at every step. The game is pleasing from all points of view, visually, as well as acoustically, and it seems like nothing is missing. All you have to do is place your bet starting from the minimum of 0.20 and going up to the maximum bet of 50.00 credits, then press spin. There are no special features in this slot game, so no Wilds, Scatters, Bonuses or Multipliers. There is nothing to distract you from the main game and regular wins, so you can be focused on just enjoying all that. The symbols look absolutely delicious but still have a sleek and vibrant design, so they can be the centre of your attention. There are adorable cherries, worth 100 credits if you spin 3 of them, 250 credits if you spin 4 and 1000 credits if you spin 5 on an active payline. You can also find cute lemons, juicy oranges and tempting plumbs, all worth the same number of credits as the cherries. The lovely grapes and huge watermelon are both worth 250 credits when you spin 3 matching symbols, 1000 credits when you spin 4, and 2,500 credits when you spin 5. Finally, the highest paying symbol and the one you’ll be looking out for the most is the vintage Lucky Seven symbol. When you land 3 of them, they are worth 500 credits, 4 of them are worth 5000 credits and the big jackpot of 25000 credits comes when you spin 5 Lucky Seven symbols on an active payline. There’s not much more than you could ask for from a fruity slot game like this one. We also often run various casino promos with this game. Juice n’Fruits has a very minimalist approach to the mobile slots experience, removing any extra features and leaving only the pure enjoyment derived from spinning the reels and watching the prizes pile up. The classic theme is perfect for anyone who needs a break from more complex games. Another juicy game to get stuck into, visit here!